Nextzett Colortec Wheel Cleaner will rapidly break up just about any contamination you have on your wheels quickly and easily. With the exception of powder-coated surfaces this non-corrosive wheel cleaner can be used on chrome, alloy, clear coated, polished, anodized, stainless steel, etc. simply spray it onto your wheels and it will quickly break down embedded brake dust and contaminants. This formula will change colors as it reacts with the brake dust and contaminants letting you know they can be removed with a steady stream of water. If you have any hard to remove contamination we recommend lightly agitating it with your wash mitt or brush before rinsing the wheel off. This powerful formula does an amazing job and your clean wheels will love the safe and effective wheel cleaner you have chose. Use the Nextzett Colortec Wheel Cleaner to clean your wheels and you will never have to use another wheel cleaner again! 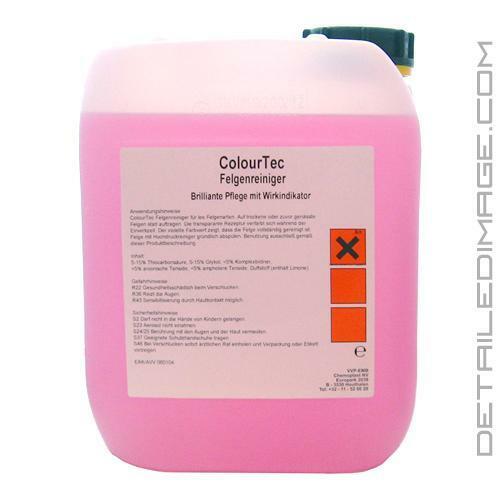 Felgenreiniger Colortec is a sprayable special cleaner with an advanced vaporising inhibitor. It proactively removes stubborn stains and brake dust without additional cleaning. Acid-free; effectively cleans all types of rims. Application: Do not apply on powder coated wheel rims. Apply generously to dry or pre-rinsed wheel rims. The formula will change color during the cleaning process. When the cleaner turns purple, the wheel rim has been decontaminated and can be rinsed clean with a strong jet of water. For extremely dirty wheels, some agitation with a wheel brush may be necessary. Use only as directed. This product hands down is the very best for wheels. Wish it was cheaper. Excellent, very strong against the contamination... the odor is not good but works and works very well. It definitely does the job but as mentioned before in the previous review, the smell is brutal. You must use this outside. It worked well for my wheels but was overkill for my particular application. I'll be keeping it on hand for when I get a customers car with tons of caked on brake dust. For light cleaning duties, I'd look elsewhere.